One of our biggest projects is the reconstruction of 5 floors in a building in the centre of Prague 5, Anděl. 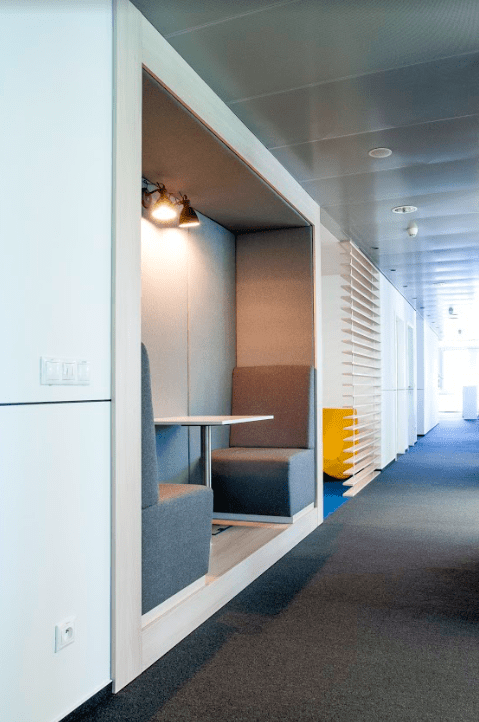 The goal of this realisation was to create an optimal working space for the employees of an international bank, while ensuring their maximal comfort and fulfilling their expectations for the office‘s functionality. The job was to create an overall design for the entire office complex, one that will be present through all 5 floors. Each of the floors is separated by a motive symbolizing cities – the headquarters of the company. These cities are symbolized through desighns that reflect their signature buildings. In the first step of the reconstruction, we started with the constructional work on each floor. Our architects, together with the client, designed the following segments on each floor: open space, meeting points, relax corners and kitchens. The interiors are designed in light color tones. The color white dominates the area, with featured details of the corporate colors. A very interesting element is created by the carpets in shades of grey, forming arrow shapes on the floor. The supplier of the SunSiro and Hussar carpet lines is the company Voxflor. 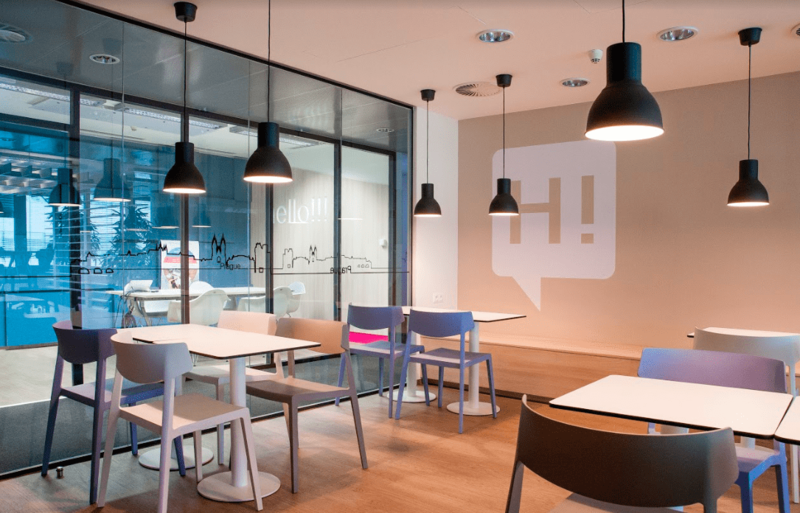 The furniture for the relaxation corners and kitchens (WING label chairs) was provided by the Spanish company ACTIU. The second, very important part in the making of the interiors for our client were the architectural acoustic elements, which were specially designed for the space. 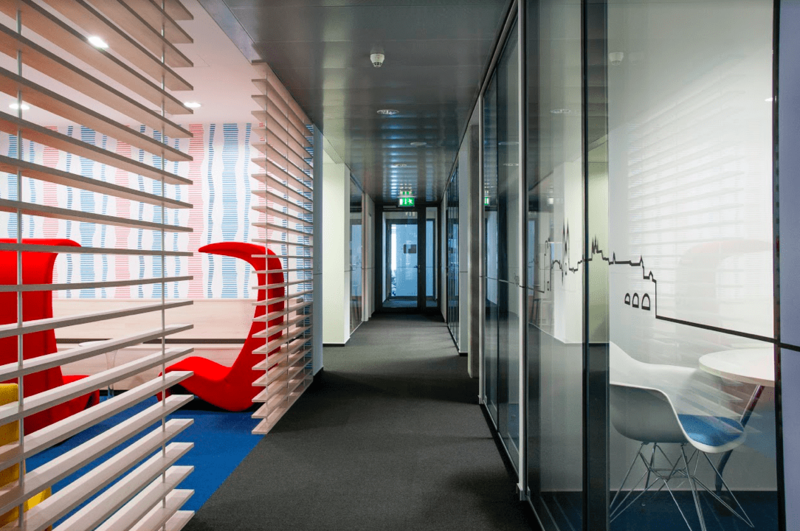 The architect from CAPEXUS designed the furniture and decorations not only to be pleasant for the eye, but also for their functionality (their frequency of use, acoustic parameters, how the zones are divided). 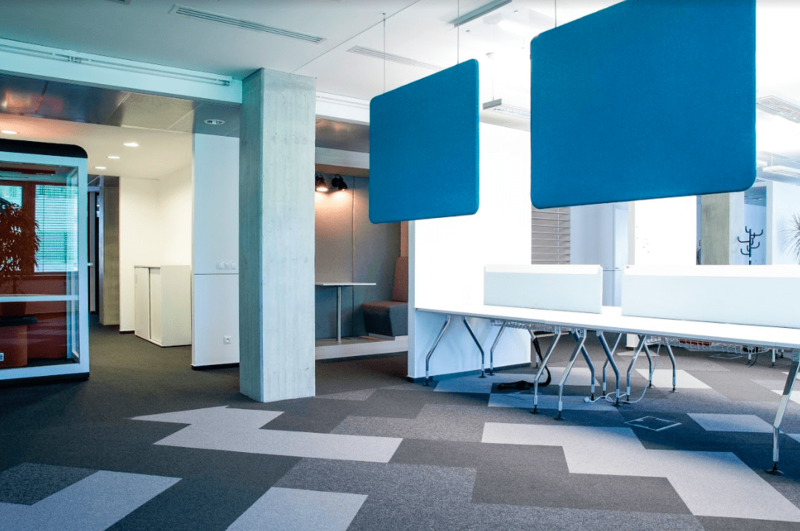 The dominant features are the acoustic panels from our partner company SilentLab. The biggest challenge for this realization was the short period of time provided for the reconstruction of a single floor, which was five weeks.